If you’re considering installing wrought iron doors you likely want to know why they are so popular. If you’re considering wrought iron entry doors for your Phoenix Valley home or business they will provide a number of key advantages. Read below to see all of the six wrought iron door advantages. 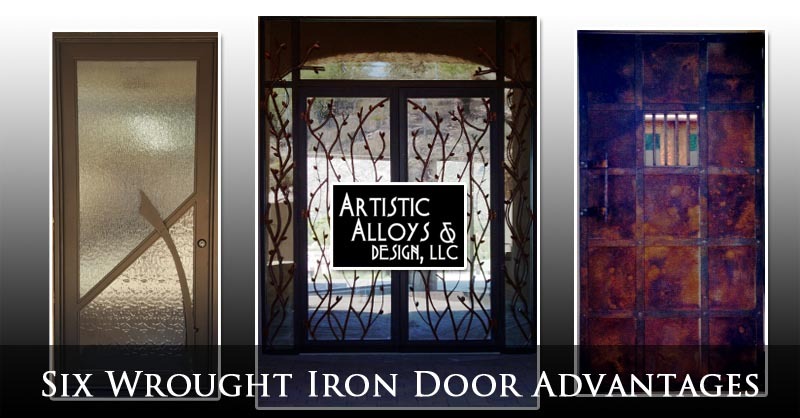 Artistic Alloys has installed wrought iron doors all over the valley from Scottsdale and Phoenix to Mesa and Chandler. There are seven main advantages of wrought iron doors for commercial and residential settings. The Phoenix Valley is one of the fastest growing economies in the United States. The value of your property is affected by the quality of the fixtures such as range hoods, railings, and even your entry doors. Upkeep on your home is a constant battle and installing low or zero maintenance elements such as wrought iron doors helps maintain and increase the value of your property. The more secure your property is also helps increase its value, which wrought iron doors excel at providing. While your primary motivation might be security, wrought iron doors are the stylish way to provide this layer of additional security. Custom wrought iron doors provide understated, elegant, and a bold statement of style that is seen by all of your visitors or customers. Whether you’re entertaining guests or welcoming potential clients a set of stunning wrought iron doors make an impression. Burglary is a reality of living in just about any city in the world now and keeping your home or business secure is serious business. The sight of imposing wrought iron security doors is a major deterrent for these would be burglars. When they see a home that has invested in wrought iron doors they choose easier targets. Wrought iron doors are much harder to break into than wooden or glass doors. Provide a 24/7 layer of security for your business and home and enjoy greater peace of mind. Another great feature of wrought iron doors is that they are strong and durable enough to include glass elements. That means the wrought iron does the job of keeping you safe and secure while the glass lets in natural light. You can use frosted privacy glass, or clear glass to make it easy to see who’s at the door. With Artistic Alloys & Design we make it easy to customize the perfect balance of light, security, and privacy for your home or business. Wrought iron’s beautiful finish is baked right in and is easy to keep looking great. Just use an oil soap to keep them looking shiny, clean, and beautiful. Unlike some alternatives you won’t need to care for them as often or use any special polishes to maintain their appearance. Wrought iron doors are an investment that can last a lifetime. Artistic Alloys fabricates wrought iron doors to last many years with extreme quality welding. The design, fabrication, and installation is all done to the highest imaginable standards to provide lifelong durability. While wood core doors are rotting, steel cased doors are separating, a wrought iron door will endure and continue to perform. If you’re interested in improving your Phoenix Valley home or business’s security, appearance, and value with wrought iron doors; Artistic Alloys & Design is your source for the best quality and unique design. We can custom design, fabricate, and install any style of wrought iron door you want. No matter how simple or ornate a wrought iron door design you wish, we will help you get the look and functionality you desire. Read more about: Phoenix Wrought Iron Door Installation.